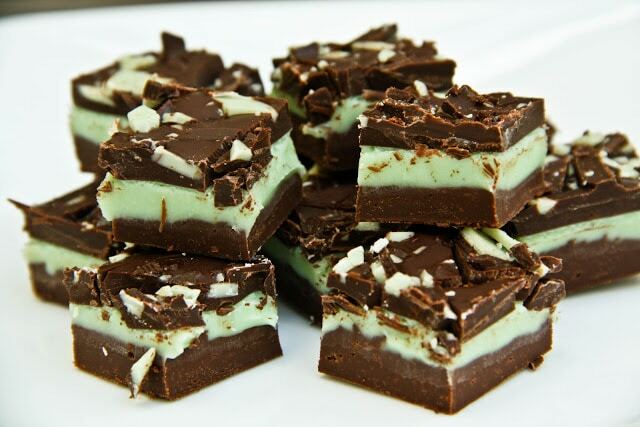 Mint and dark chocolate…one of my favorite combinations! 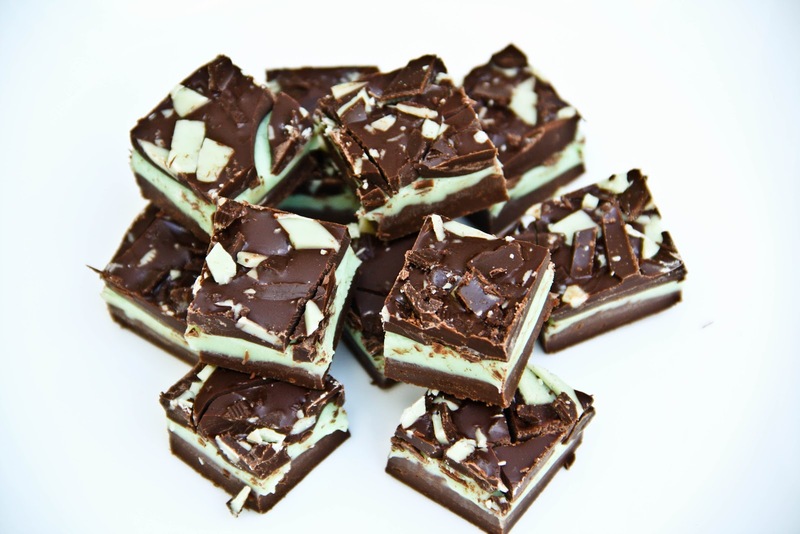 As soon as I saw this fudge recipe, I instantly knew I had to make it for our holiday party this year because I love Andes Mint Chocolates. It was very easy to make, very pretty and holiday themed, and tasted even better than Andes Mint Chocolates! The original recipe states to use semi-sweet chocolate, but of course I had to substitute it for some Ghiradelli Dark Chocolate. 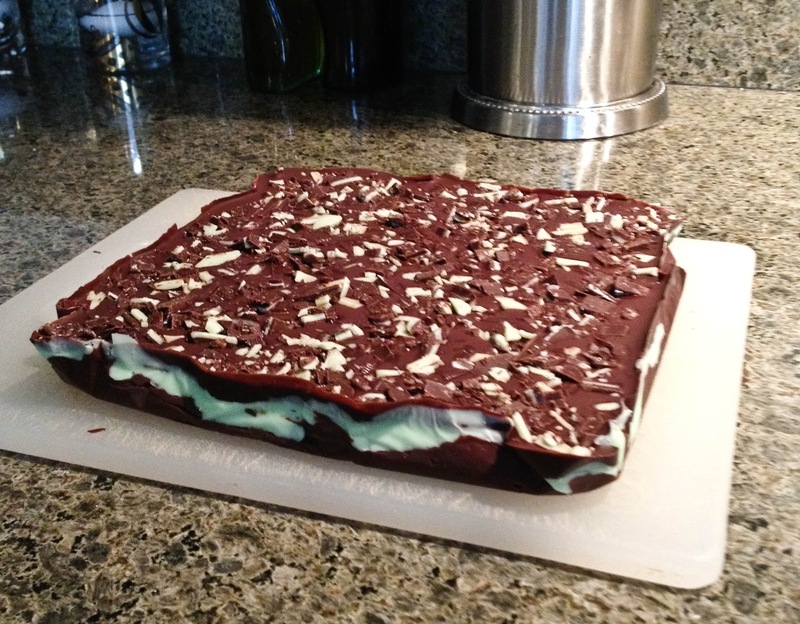 I also used a bit more peppermint extract and food coloring to give it some extra minty flavor and look. The fudge starts off with a traditional fudge layer made of dark chocolate chips and some condensed milk. The second layer consists of white chocolate, condensed milk, peppermint extract, and some green food coloring to give it that mint color. The top is a solid dark chocolate layer. The recipe stated to top it off with some mini-chocolate chips and/or Andes chocolate chips, but I decided chop up some actual Andes Chocolates instead since I could not find any Andes chocolate chips at my nearby grocery store. Pop the fudge in the fridge for a few hours and out comes this beautiful decadent 3-layer fudge! Line a 8×8 baking pan with parchment paper. Spray the paper with a non-stick spray and set aside (I used a really small amount of Pam vegetable oil spray). First Layer. In a small saucepan over low heat, combine 3/4 cup condensed milk and 1 cup dark chocolate chips. Stir occasionally with a spoon until all the chocolate is melted and combined with the condensed milk. Pour and spread the mixture into the pan and chill in the fridge for 5-10 minutes. Continue to make the second layer. Second Layer. In another saucepan over low heat, combine the remainder of the condensed milk and white chocolate chips. Stir occasionally with a spoon until all the chocolate is melted and combined with the condensed milk. Remove from heat and add the peppermint extract and green food coloring. Pour and spread this mint layer on top of the chilled chocolate layer and chill again for 5-10 minutes while you make the third layer. Third Layer. If using Andes Mint Chocolates, unwrap and chop into small pieces using a chef knife. Melt the remaining 1 cup dark chocolate chips with 1 tsp. shortening in the microwave in 30 second increments, stirring in between until completely smooth. Pour and spread over the chilled mint layer. Top with mini-chocolate chips, Andes Mint chips, and/or Andes Mint Chocolate pieces (depending on what you prefer or have). Refrigerate the fudge for about 4 hours to allow it to completely set. Once the fudge is set, remove from the fridge, take out the parchment paper with the fudge, peel off the fudge, and cut into small squares. Serve immediately or store in an airtight container in the fridge for up to 2 weeks. You can also freeze fudge easily and thaw it out when you need. Enjoy!! « Our 5th Annual Holiday Party: Bite-Sized Finger Foods! It looks amazing! I'm so glad you made my fudge recipe - this will always be one of our very favorites. You know andes now has bags of their broken up candies in red and green! How exciting!! I did not know that. Now I think I'm going to go find some and make this fudge recipe this month sometime! Thanks for letting me know! What shortening do you use? I have this one: Spectrum Naturals Organic All Vegetable Shortening, non-hydrogenated. But I'm not sure it matters what brand you use, this just happened to be the one I picked up (the only brand they had) and the one I use all the time. And it stays for a long time. I actually just made some cookies using this instead of butter or oil and they turned out delicious...I can point you to the recipe if you are looking for something else to make with shortening as well after purchasing it. Let me know how it turns out! Anjali these were a hit! Avani made these for our work cookie exchange this year. We can't stop talking about it and asked Avani to share the recipe. Thanks for sharing! Aww thank you so much! She told me she's been making this non-stop and it's been a huge hit! I told her that if people like the peppermint chocolate flavor, another really simple recipe to make is my oreo dark chocolate bark recipe (on this site as well), but using the peppermint oreos that trader joe's carries over the holiday instead of regular oreos. I made them this year since I didn't have a lot of time and they were a huge hit as well, although this fudge is to-die-for! Thank you so much for commenting and visiting my site! !